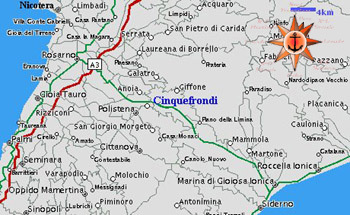 In car of the Tirreno : Autostrada A3 SA-RC - Exit Rosarno - Strada Grande Comunicazione Ionio-Tirreno - Exit Cinquefrondi-Polistena - To continue for Polistena - a Mt. 400 approximately from the exit. In car of the Jonio : Strada statale Ionica 106 - locality Grotteria Mare - Strada Grande Comunicazione Ionio-Tirreno - Exit Cinquefrondi-Polistena - To continue for Polistena - a Mt. 400 approximately from the exit. Station of Gioia Tauro - connection through Ferrovie della Calabria line Gioia Tauro-Cinquefrondi or in car. Station of Rosarno - connection with car. Aeroporto of Reggio Calabria "Tito Minniti" - connection through car and bus. Aeroporto international of Lamezia Terme - connection through train and car.